Concentrically ground polished striking head and pein, bevel with cheeks ground smooth finished in rust resistant black paint. Handle made of white hickory and triple wedged into eye with wood and steel wedges. Dropped forged high carbon steel heads with tempered striking face; hickory handle. Pull apart capacity exceeds ANSI/ASME specifications. 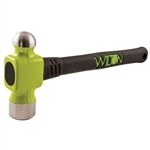 Heat treated, high carbon steel head, head to handle assembly, flared end for greater control and rim temper reduces incidences of chipping or spalling, molded jacket over graphite handle with cushioned grip to absorb shock. Exceeds ANSI safety specifications.